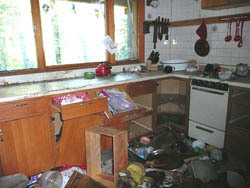 A bear broke into this cabin and ransacked it in search of food. Gayle Nienhueser and his family have owned a cabin off the road system near Trapper Creek for 30 years. Bears would sometimes make their presence known by rubbing against a cabin corner or chewing on something like a snowmachine seat. But in all the time they have had the property, bears never broke into the main cabin or caused significant damage, Nienhueser said. Then, between last August and early winter, bears broke in to the main cabin twice. Both times they left behind such a mess it took days to clean the muck from the floor and haul out debris. 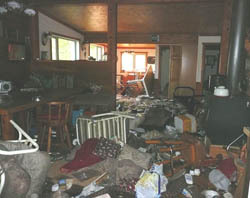 The second break-in was the most destructive, Nienhueser said. The Nienhuesers were not alone last summer. In and around Petersville and Trapper Creek, Nienhueser estimates bears broke into at least 35 cabins. Neighbors began comparing notes and taking steps to fortify cabins. After learning of the problem, Fish and Game Regional Supervisor Bruce Dale approached Brian and Diane Okonek of Talkeetna for help in hosting an educational program for cabin owners. The Okoneks had earlier helped found a local group called the Talkeetna Bear Necessities Coalition aimed at minimizing human-bear conflicts. The two-hour seminars, held in Anchorage and Palmer in late April and early May, featured presentations by a bear biologist, a wildlife trooper, Fish and Game staff and Brian Okonek. Topics ranged from bear behavior and hunting regulations to electric fences and bear-resistant shutters and barriers. The idea is that if cabin owners can keep bears from breaking in or finding food if they do break in, the bears should eventually leave the cabins alone. Residents have already killed some bears around cabins, but as Fish and Game biologists pointed out, it’s hard to know if the bears shot are the same ones causing damage. During both seminars, wildlife troopers discussed Alaska’s regulations governing when bears can be shot and how. Although it is legal to shoot a bear “in defense of life and property,” that may only be done under special circumstances such as when a bear is charging you or breaking into a cabin when you are inside, troopers said. Bears that become habituated to human food and trash are more likely to associate people with food. Troopers instead advised cabin owners to legally take bears by obtaining a hunting license and following all hunting regulations. Many cabin owners wanted to know why bears would suddenly start breaking into cabins that had previously been ignored by bears for decades. Why the sudden change in behavior? If a bear finds food inside a cabin, that will encourage that bear to break into similar structures to find more food. “A bear can be a pretty challenging animal once it gets in its mind something it wants,” he said. Fish and Game biologists are recommending that all food stored inside cabins be in bear-resistant garbage containers – or that nothing be left behind. Until bears learn that breaking into a cabin yields no food reward, there is going to be a painful transition, Hilderbrand noted. Bears may keep trying for some time even when they don’t find anything to eat, he said. Other preventative measures discussed at the seminar include installing an electric fence or building bear barriers. Doug Hill, a wildlife biologist with Fish and Game and manager of the Palmer Hay Flats State Game Refuge, talked to cabin owners about how to set up an electric fence. The fences emit high voltage, low amperage pulses through wires. The shock is painful to bears but not dangerous, Hill said. Fences can be simple or elaborate, Hill said, and have been used effectively as deterrents against black bears, brown or grizzly bears, and polar bears throughout Alaska and Canada and other parts of the world. They can be used to protect everything from trash transfer sites and houses to beehives and fish hatcheries and smokehouses. Effective electric fencing requires proper materials (a UL approved charger, for example), setup and maintenance. Brian Okonek showed cabin owners several designs for bear shutters over doors or windows. He recommends cabin owners use at least ¾ inch plywood and mount shutters as flush to the wall as possible so bears can’t pry them off. Okonek also suggests using fully threaded hanger bolt screws instead of nails, which are easier for bears to pop off. A variety of bear proofing techniques can prevent bears from accessing a remote cabin. Doors, when possible, should open out, not in, Okonek said. Inward-opening doors can be strengthened by adding a chain or bars that prevent the door from being pushed in by a bear. Another option is to add removable metal grates over windows or doors. The key, Okonek said, is to think as creatively as possible. But also keep it simple, so barriers are easy to install and remove. Try to think like a bear would and then try to outsmart the bear, Okonek said. Like many of their neighbors, the Nienhuesers have spent considerable time and expense this winter to prevent another bear break-in. After attending the Anchorage seminar, they decided to install an electric fence around the cabin powered by a solar panel and battery at a cost of about $500. The family also made more bear boards using screws, and fastened them to the porch so bears could not push them out of the way. The shutter over the main cabin door is also now fastened shut with hangar bolts and wing nuts instead of nails. Nienhueser said his family used to leave food staples in the cabin such as flour and dry goods. “It was all in mouse-proof containers, but not bear-proof containers,” he said. Ginger Silver, another longtime cabin owner in the area, said their family’s cabin was also broken into by bears for the first time last September after 35 years with no break-ins. “It was just open house for the bears after the first bear got in,” she said, noting that both black and brown bears appeared to have ransacked the cabin. Silver said her sons cleaned up the considerable damage over the winter and installed stronger shutters and new door barriers. Elizabeth Manning is an outdoor writer and an educator with the Alaska Department of Fish and Game in Anchorage.